Secrets From The Lost Bible by Kenneth Hanson, PH.D.
‘Hidden away for centuries, these rediscovered ancient texts reveal vital knowledge to empower humankind.’ Back cover blurb. Wow, a pretty bold claim – ‘knowledge to empower humankind’. Dr. Kenneth Hanson presents us with a number of texts; some which may be partially familiar – Adam and Eve and the Tree of Knowledge, and the less familiar (to myself) Bel and the Dragon, along with previously unknown stories about familiar Biblical figures. I say partially because, as Hanson reveals, even the Biblical texts we may be familiar with have sections missing. The Dead Sea Scrolls, for those who have never heard of them are, briefly, scrolls – or fragments of scrolls, that have been discovered/uncovered in caves near The Dead Sea. Some date back to the 8th century BCE (Before Common Era), and are written in Hebrew, Aramaic and some in Greek; the initial discovery being made in 1947 by a Bedouin shepherd. Since then around 8oo plus scrolls have been found; mostly fragmented. They are divided into Biblical and non-Biblical, with for example, 25 copies of Deuteronomy, texts on law, psalms and more. 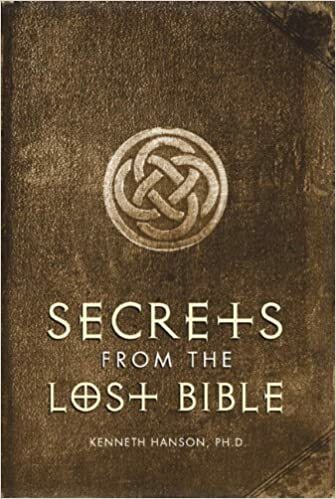 Now, I have to make a confession here – I have not yet completed reading Secrets From The Lost Bible – It is, to be honest, taking me forever, but I do only read a bit at a time, plus, I keep re-reading sections (I also have a habit of having two or three books on the go at once). This is one of those books that you read a little at a time and absorb before progressing. It is to be sipped, not gulped – mulled over, not galloped through. Essentially, the Gospel of Thomas is telling us that we, each individual, is not only born innocent (as opposed to the church’s teaching on Original Sin), but that we can each find Knowledge ourselves – without the need of a Religious Leader. That alone is enough to set many conservative/mainstream Christian’s/Jewish teeth on edge, goodness knows what the Creationists make of it.The Gospel of Thomas was declared Gnostic heresy, and promptly filtered from their system – Gnosticism and the Kabbalah have been criticised by those wishing to keep their sheep on the straight and narrow – as they perceive it. Hanson guides us through selected texts with explanations, he examines what lessons may have been lost when those who decided which books to include in the Bible and Torah made their decision to exclude these. He is non-judgemental, he does not lay blame, he simply offers us the works and a way to understand them, and why they may have been excluded. Hanson offers everyone, not just people who follow a religion, a way of understanding the hidden way to find harmony with…. well, if you do not believe in a god, it would be yourself and the universe. I am finding the book a very interesting read. Hanson provides insights and fills in holes found in the traditional Bible. If you are a theology scholar, I recommend you add this to your reading list. His writing style is very easy and he provides us with short anecdotes of his own personal moments of realisation, and he is joyous in his writing, which can be a rarity in academic circles, certainly not stuffy. Just because you are a ‘good’ Christian/Jew/Methodist/ETC, doesn’t mean you shouldn’t question what’s in the bible, it has flaws, why does it have flaws? Because it was written by men, and moreover, men who have decided to withhold information from us. Kenneth Hanson, Ph. D. is an associate professor in the University of Central Florida Judaic studies program and scholar of Hebrew language and literature. He is the author of Blood Kin of Jesus, Dead Sea Scrolls: The Untold Story and Kabbalah: Three Thousand Years of Mystic Tradition.